Just as 4Gb/sec Fibre Channel is poised to make its move into the data center, Ethernet is roaring back with its 10Gb/sec technology. But the lure of pure speed might not be enough for Ethernet to overtake Fibre Channel--at least for now. Shopping for storage: One vendor or more? Buying storage today is more difficult than ever. You need to get the best acquisition price, the lowest long-term TCO and avoid vendor lock-in. On top of it all, you must decide which is best: one vendor or more? Fibre Channel directors don't just provide lots of ports, they also offer ways to connect disparate SANs, isolate data and devices within a fabric, and configure throughput for specific applications. We look at how the big three directors match up. 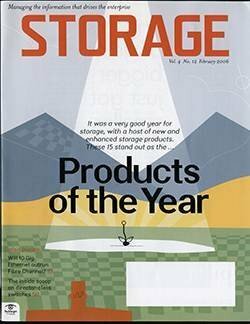 Our fourth annual Products of the Year awards spotlight the 15 new or enhanced storage products that stood out from the rest in 2005. The editors of Storage and SearchStorage.com, along with a panel of users and industry experts, selected these winning products based on their innovation and performance, among other criteria. Storage bin: Marriott's lost tapes are just the latest in a string of high-profile storage snafus. But with plenty of viable security solutions available, there's simply no excuse for these very public blunders. The midrange array market may still be hot, but storage managers are wary of getting burned. While midrange vendors keep piling on the features, storage pros are becoming disenchanted with midrange systems despite their more modest price tags. With government regulations like HIPAA and SEC 17a-4, archiving has become a global requirement. But how safe is all that archived data?